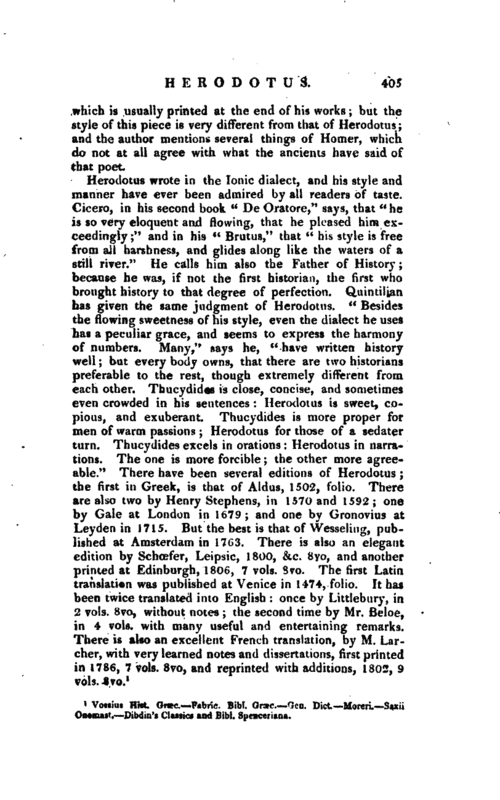 His work is divided into nine books, which, according to the computation of Dionysius Halicarnassensis, contain the most remarkable occurrences within a period of 240 years; from the reign of Cyrus the first king of Persia, to that of Xerxes, when the historian was living. These nine books are called after the nine Muses, each of which is distinguished by the name of a Muse and this has given birth to two disquisitions among the learned first, whether they were so called by Herodotus himself; and secondly, for what reason they were so called. As to the first, it is generally agreed that Herodotus did not impose these names himself; but it is not agreed why they were imposed by others. Lucian, in the place referred to above, tells us, that those names were given them by the Grecians at the Olympic games, when they were first recited, as the best compliment that could be paid the man who had taken pains to do them so much honour. 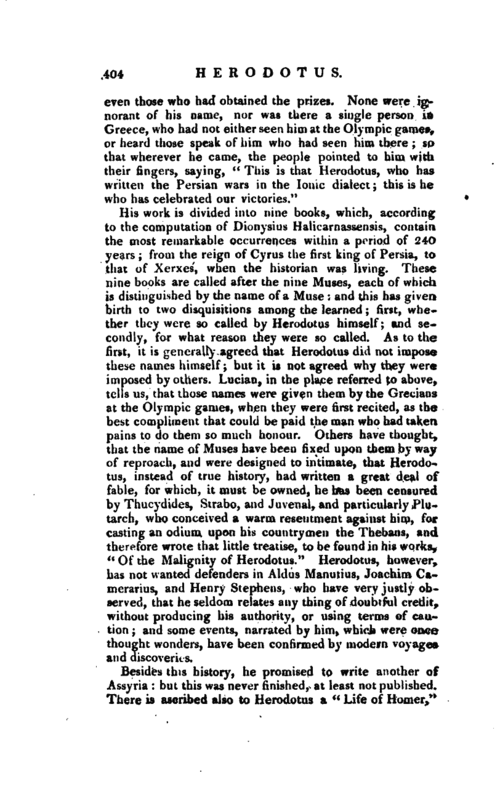 Others have thought, that the name of Muses have been fixed upon them by way of reproach, and were designed to intimate, that Herodotus, instead of true history, had written a great deal of fable, for which, it must be owned, he has been censured by Thucydides, Strabo, and Juvenal, and particularly Plutarch, who conceived a warm resentment against him, for casting an odium upon his countrymen the Thebans, and therefore wrote that little treatise, to be found in his works, “Of the Malignity of Herodotus.” Herodotus, however, has not wanted defenders in Aldus Manutius, Joachim Camerarius, and Henry Stephens, who have very justly observed, that he seldom relates any thing of doubtful credit, without producing his authority, or using terms of caution; and some events, narrated by him, which were once thought wonders, have been confirmed by modern voyages and discoveries. Besides this history, he promised to write another of Assyria: but this was never finished, at least not published. 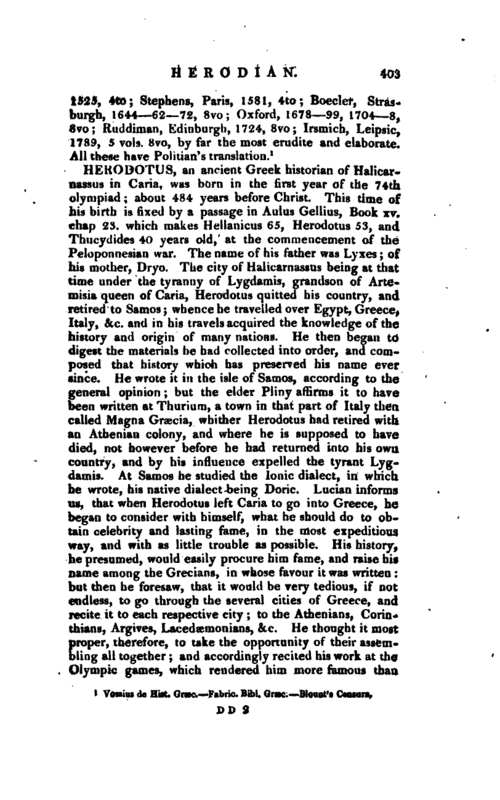 There is ascribed also to Herodotus a “Life of Homer,” | which is usually printed at the end of his works; hut the style of this piece is very different from that of Herodotus; and the author mentions several things of Homer, which do not at all agree with what the ancients have said of that poet. Vossius Hist. Grsec. Fabric. Bibl. Graec. Qen. Dict. —Moreri. —Saxii Onomast. Dibdin’s Classics and Bibl. 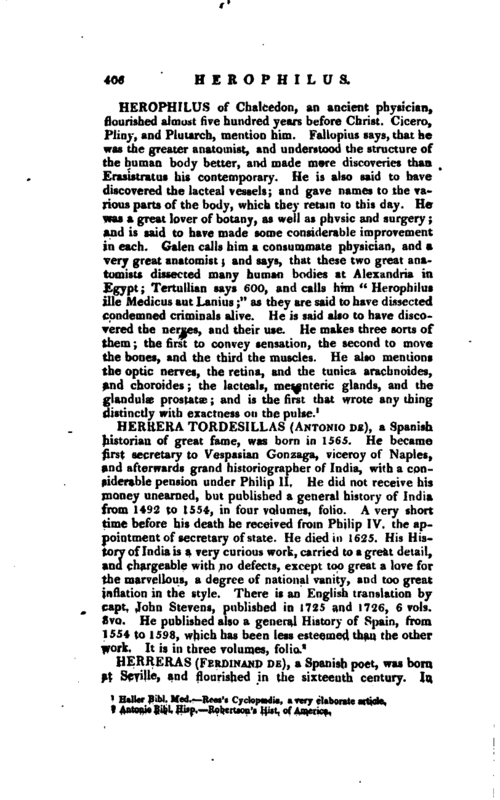 Spenceriana.